Here is the story of how a good solid couple of months of training went wasted on race day. After the Denbies 10 mile race I had just over two months to prepare for the South Downs Way 50 miler. Things were all planned. I did two more weeks of interval training with some longer runs in the weekends (for a total of 88k and 104k) and then started the tempo runs block. I loved them. I did one solid week of 108k with a nice long run in the snow with Craig in Wimbledon common, then took it easier by skipping two days to do a very tiny tapering before the February race, the Hampton Court Half Marathon. I wanted to do well and see if I could beat my PB. I had not done any flat half marathons in years, so this was a good occasion. Things went fine for the first 13k. I kept an average pace around 3:50/3:55 min/km and felt ok, but I could not hold the pace long enough and did the rest of the race just above 4:00 min/km. I finished in 1:24. My target was 1:23, so I was not too far off, but still, I was a bit disappointed. Here is the Strava of the race. 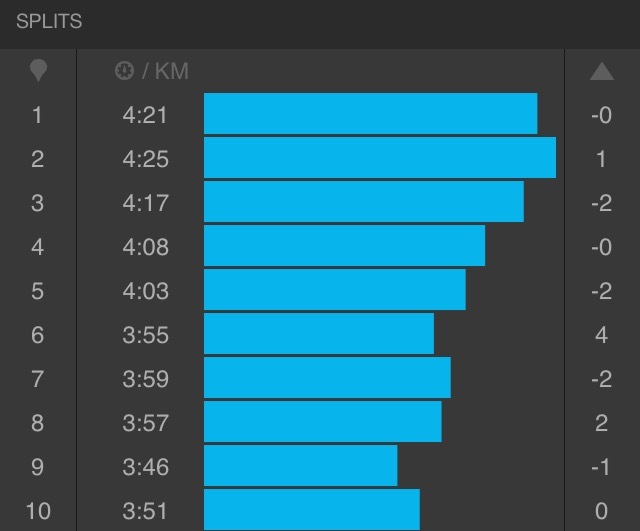 The week after I did a couple of easy days and then resumed the tempo runs sessions. Here is an example if interested. In the weekend I did a longer tempo run session up and down Richmond Park and then went for 30k on the NDW (saying that it was muddy is an understatement), completing a 96k week. The last week of February I was feeling a strange pain on the soleus and Achilles tendon in the left leg, so I took it a bit easier but still managed to run 33k with Craig which is always fun. And that was the end of the tempo runs block, time to start the Steady State Runs part. Here is an example. On the 11th of March I ran the Thames Meander Marathon with almost no tapering and with the left leg still a bit sore. I was not sure whether to do it or not as I was afraid to get even more injured but I went anyway. Good thing I did as I enjoyed it a lot. I started slow to see if the left leg would behave, but when I saw all was fine I just kept running at a steady pace actually accelerating quite a bit in the second half. I suffered in the last 5k and slowed down a bit too much, but overall I am happy with the result: 3:17, which is also my marathon PB. I think I can do better than that, but probably not break 3 hours like I had planned at the beginning of the year. At this point there was only one month left before the South Downs Way 50. I really enjoyed the Steady State Runs even if it meant waking up at 4:30 in the morning to be able to run 20k before going to work. The week after the marathon I ran 127km. 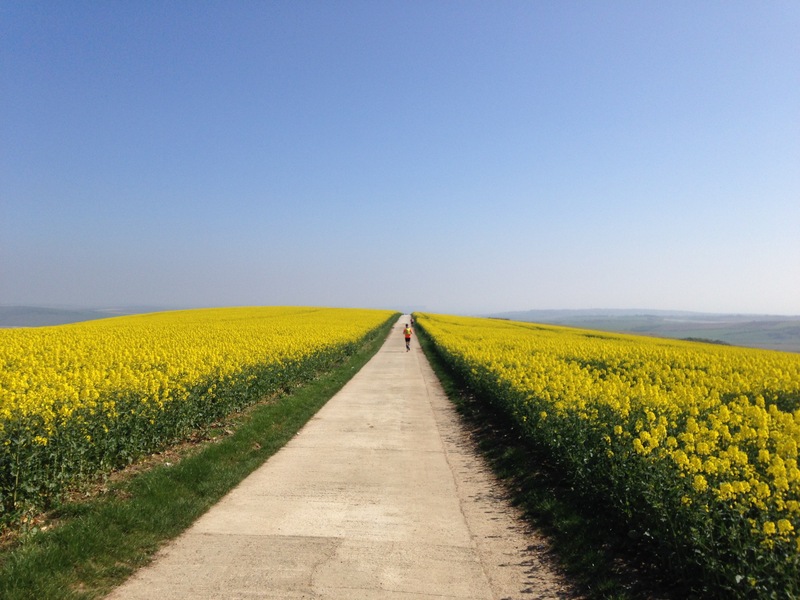 On Saturday I killed myself by running 1:30 easy and then do the usual SSR training, for a total of 35k with a massive negative split and then, not tired enough, on Sunday I went on the North Downs way for 26k of pure joy. The week after I did even more, 138k. Concluded with 40k on the river on Saturday and a killer SSR session on Sunday. You know when Rocky runs up the stairs and knows he is ready? I felt the same. I reached the top of Richmond Hill with many km in the legs and still sprinted up like crazy. I felt invincible, ready for the SDW. And invincible I was not, sadly. I started 2 weeks of tapering. First I did an easy 67k week and then disaster struck. I got ill! The Tuesday of the SDW race week I was in bed with a fever. Months and months of training, rigorous every week, I probably just skipped 2 days, woke up at silly hours, killed myself in the weekends. Did everything right, foam rolled every evening, fixed minor injuries, kept a relatively good diet, I did EVERYTHING right for four months and I end up in bad 3 days before the race? I was sad, very sad. I hoped it was going to go away quickly and I actually thought it might have been good to sleep for days before the race, but on the Friday I was still feeling like my head was going to explode and my legs were made of rubber. I went to the office to convince myself I was fine, but I was not. On Friday evening I packed all the race kit with the plan to see how I felt the day after. I really did not want to miss the SDW50 again. Last year due to the shin splints injury I missed it and lost the chance to do the Centurion 50 mile Grand Slam. So even if I woke up a bit energy-less I went to the race anyway. The weather was amazing, not a single cloud in the sky. The South Downs are some of the most beautiful hills and when I got to the starting line and sucked all the excitement from the other runners I forgot about being ill and I really looked forward to racing. After a couple of miles my head cleared and the legs seemed ok, so I decided to race it as I had originally planned, which was quite fast. I reached the first aid station at Botolphs (11 miles in) in just over one hour and a half. Almost 17 minutes faster than planned. Was this worrying me? No, because I am not smart enough. I reached the second aid station at mile 17 in 30th position. Now only 8 minutes ahead of the race plan. Maybe it was time to get worried as it was clear I could not keep the pace. Then things started going horribly wrong. My legs decided it was time to go in flu mode and everything started aching. Even my knees were painful in the downhills. As if that was not enough my stomach felt upside down. I painfully reached Housedean Farm (26 miles) hoping to find a toilet. When I was told there was none I felt lost. The South Downs are not like the North Downs. There are no trees or bushes big enough to allow people to hide and do what they do when there are no toilets around! I had 7 more miles to run before I could find a toilet at the next aid station and this is where the worst part of the race started. I could hardly run uphill and I was super slow. Even after the long toilet break I still felt bad and the long climb after Southease was a long death march. At the top I felt better and actually ran 5k under 5 min/km but when I left Alfriston (mile 41) my stomach was not having it. 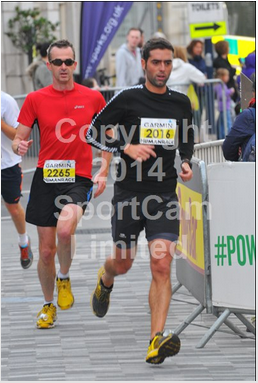 Luckily I was joined by Tim, who kindly decided to wait for me and finish the race together. I am sorry I made him do the last 8 miles so slowly, but every time I tried to move faster the stomach made sure I knew I was not in charge of the day. We finished in 9 hours and 18 minutes. 48 minutes slower than I was aiming for. I was actually convinced I could do it in 8 hours. I have the excuse of the flu but I was really disappointed with my performance. Less than 4 hours to run the first half, more than 5 hours to run the second? Not good! It was an amazing day, beautiful vistas, plenty of nice people to meet, but not the race I wanted to do. I will have to go back next year and do it right. Now I need to concentrate in keeping the form and not getting ill for the NDW50 next month. I will not have any excuses there and I will try to race smarter. I always say that! After a week of relative rest after the last marathon I started running again with more intensity and it has been a good week. On Monday I could not run, but it was fin. I’ve decided that from now on Monday will be my rest day (maybe my swimming day) so that I will be able to do two long runs back to back on Saturday and Sunday. On Tuesday I went out for a relatively easy start of the week. 12k at 4:26 min/km. Nothing special to report, apart from the fact that running on the river is now possible. Bring on the spring! Wednesday I went out for a short 10k run with the idea of trying the new Zealot and taking it easy. I was so excited about running with new shoes that the “taking it easy” part was soon forgotten. Even the first warm up kms were done faster than 4:25. I ended up going faster and faster (I ended up doing 10k with a 4:04 average). The shoes felt good, almost like not wearing them. Very light but still very cushioning. They are definitely shoes that want you to go fast but hold your form. The only thing I don’t really like is the colour scheme. A bit too garish for me. So much so that when I left them in the garden after this first run a magpie came straight to peck them. On Thursday I took a relatively new route via Richmond. The hill in the middle was fun and the big full red moon I saw when at the top, with the river below, was breath-taking. I did a total of 14k at 4:26 for just over one hour of running. In the next couple of months I need to be careful and prepare a nice training schedule. Otherwise I will end up running every day at this sort of speed. I need more variety, slow days, fast days etc. Otherwise I will not improve if I keep on running at this pace every day of the week. To remedy this issue straight away I did some speed work on Friday. To feel like a marathon runner I did three 2km intervals at 3:45 with two minutes rest. I was aiming for 3:40, but I was a bit tired. Not too bad anyway. On Saturday, armed with just one gel, I went out for a long run (not too long as I have to keep some energy for next week’s race). I tried to keep the heart as close to 140 bpm as possible. It was not easy as I went to Richmond park which is a bit hilly. It was a wonderful day. Running in shorts with no hat/buff, no gloves etc, feels so much better. I did 26.5km in 2:02 (4:39 average pace). And then on Sunday I went out again! It was even sunnier. I went around Bushy Park and then explored a new part of the river for me, the one that goes away from Hampton Court but in the other direction, towards Molesey. I think it goes on for a bit, but I had to come back after a while as I was feeling a bit tired and I had no water and no gels. I also did not want to overdo it. I ended up doing a precise 21.1km at 4:30 average. I will definitely go that way again as it is also another very nice soft trail with nice views of the Thames. Overall it was a very good week. Went out running 6 times for a total of 96.5km. I am also very excited for having discovered a new pair of shoes. I feel this will not be the first pair of Zealot I will own. I don’t want to be too optimistic, but I have run 80+ km in 5 days in the Zealot and I never felt the usual right foot plantar issues once. Could they be the solution to my little niggles? Now it is time to take it easy for a week and then run my third marathon in 3 months. This one is flat and while it is not on the road I would not consider it a trail marathon. I will try and do it in less than 3:30. I have done 40k of that route and I know that in a good day I could do the whole 42k in 3:20/3:25 so we’ll see. I hope I will not overdo it in the first half as usual. Monday was an easy recovery day. I did 10Km at 4:33 min/km. Nothing special but I felt really good. Running long distances during the week end (38km was a lot for me) really adds to my confidence and going out for a short run where I do not have to worry makes it really fun. Also running more kms per week has definitely made me a lot stronger and I can feel it in my legs. I am not as tired as I used to be the first month of waking up at 5am every day. Now it is a routine and the body is ready. Whether it is ready for a trail marathon in a month time we’ll have to wait and see. Tuesday was again an easy run day. I decided to do more kms than I usually do in the week days. I’ve read somewhere (I think in this old Roberto Albanesi’s book) that a training session needs to be at least one hour long. 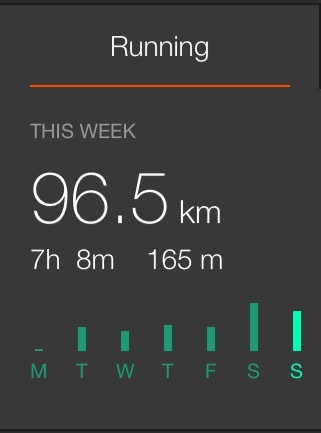 Most of mine are 10/12km during the week so they last less than 50 minutes. On Tuesday I did 15km. For an exact total of an hour. It was a good run but it was extremely cold, below zero. I could hear the crick crick that the shoes did on the ice on the road. I challenge my friends @unknowndest and @manuontrail to run in shorts in those conditions! (We have an ongoing discussion about long tights and pants). Wednesday was the interval training day so after the usual 20 minutes warm up I did 4 x 4′ at 3:40 min/km with 4 minutes rest. 4×4+4. The day of the 4s. I ran a total of 14km in exactly an hour (Albanesi would approve). Thursday I again went out for an easy recovery run. It was a bit of a suffering due to cramps. I went really slow, accelerating only at the end to go to the toilet as quickly as possible. 10km in total, but not much fun. Wind and ice did not help either. Friday I woke up, saw that there was a storm outside with horizontal rain and decided to be lazy and went back to sleep. Obviously regretted it as soon as I woke up 2 hours later. Saturday I was supposed to do around 60% of my longest run of the previous The Cool Impossible training plan part one, but as I skipped the day before I decided to do a bit more. I left home as the sun was coming out: beautiful clear sky, frozen ground, very few people around, a light fog on the river, perfect. Having rested the day before I felt really good and did a relatively fast 30km run (my new 30k PB) through Bushy Park, the Hampton Court’s river side, around the whole of Richmond Park, Kingston to Teddinton Lock and then home. When I stopped I still had a lot of energy. I am really proud of myself. In less than 5 months I went from running 21k to 30k with the same effort. Running 30k now seems really easy. A good week then, 79.2k in total. One more normal training week and then I will rest a bit during the Chirstmas week. The first marathon is approaching! Go outside and have fun! Sunday I took part in my last race as an under 40 runner. The Kingston Run Challenge. 16 miles. As mentioned before I have done this race more than once. It takes place twice a year with different names and sponsors, but the route is basically the same and I love it. Most of it is on the river on the Hampton Court Palace side where I run most of my mornings, when there is enough light (so not now). Plus it is always very well organised. Humanrace events always deliver. This time it was as good as ever if not better as the market square in Kingston is finally open and looking great. The only issue I had was that I could not find the bag drop. But let’s start from the beginning. I woke up pretty early to have breakfast and spend enough time getting my stomach ready (if you know what I mean). I left home 45 minutes before the start. That should have given me enough time to get there and warm up for 20 minutes. Instead not finding the bag drop I wandered in the wrong direction for too long and ended up only having 10 minutes to get ready. Not too much of a problem. I placed myself just behind the 6 min/mile pacer and got ready to start. It was a beautiful sunny morning, cool and perfect for running. There were a lot of runners. Around 900 people, but mostly doing one 8 mile lap, two third I think. The atmosphere was very exciting. I had decided to run it at a steady pace around 4:20 min/km as I thought that my last weeks of training were not really geared toward speed and I was not ready to run as fast as the last time (4:07 min/km). I was wrong. I started fast as usual, excited by having other fast runners around. For the first time in a race I decided to keep an eye on my heart rate. I looked at it after 500 meters and it was 180 bpm. Obviously wrong as usual. It is always off at the beginning (either that or my heart is crazy). I ignored it and tried to get into the pace I had planned to stick to. After less than 4 km a guy (number 2265) caught up with me and we started chatting. That’s the reason I never run with headphones and music. I like to interact with people, especially in races. He asked me what my target pace was, I told him 4:15 as I was not sure I was going to be as fast as last time (I felt a bit stupid saying it, as if saying: I am very cool, but today I will take it easy). Anyway we agreed to run together. Last time I did that I attached myself to the wrong runner in a 10 miles race and after 4 miles at 3:45 min/km I was dead and it ruined the whole race. So I was a bit cautious, but joined him. Every 2 or 3 km we swapped. It felt like when he was in front we were going faster while when I was in front we were slower. It also felt like I spent more time in front. I think it is just that when you are leading you suffer more I guess. We finished the first 8 mile lap strong. We did not say much apart from “you OK?”, “cool”, ” nice one” etc. Going through the market square was a nice boost with all the people cheering. Plus it feels good to keep running and skipping the exit for the one lap finish line. We ran a bit more and then I started losing my new friend. We where on the off road bit on the river. That part is my Bermuda Triangle. I have no idea why, but every time I run there, that particular bend, in any direction, I slow down. I cannot help it. I saw him adding meters between us and I was a bit desperate. I did not want to see him disappear in the distance and do more than one quarter of the race “alone”. Then something strange (but cool at the same time) happened. At km 18 in front of Hampton Court I accelerated to stick to him, overtook him to do my bit in front and kept running. Without realising it I accelerated and kept going until after 2 km I realised I was going at a pace under 4 min/km. I turned around and felt a bit guilty. I left him behind, exactly what I was hoping he would not do to me! But it felt too good for me to slow down. I was at around 20 km in the race and I felt like I just started. I was going at 3:50 and my heart was going at less than 160 bmp. I silently said thanks to the training plan I am following, I understood how wrong I was in thinking I was training too slow and just smiled and kept running. Feeling elated and indestructible. I overtook everyone I saw. If I spotted someone in the distance I aimed to reach them as fast as possible. It was probably the most enjoyable race I ever did. I admit the last km I was happy to see Kingston approaching. Then the crowd cheers, a final acceleration to look good and bam! crossed the line with the same average pace than last time. 4:07 min/km. Wonderful. My family was there which was super nice too. My daughter took the video below. We later found out I finished 10th. My best ever result. I could not have been happier. After a couple of minutes number 2265 arrived. I thanked him for helping me keep a good pace three quarter of the race. Without him I would have been a lot more conservative, so thank you again! So overall I am extremely happy about the result. I am now even more confident in my training plan and I am looking forward to waking up at 5 am every day until the next race! And then do it again. Here is the Strava page if you are interested. I had a bit of water at km 9 and 22, but not much. I also tried the PowerGel Shots that were distributed at Km 16, but found them too big and could not chew on one while running. A big thanks to Human Race for organising the event and to the wonderful marshals. Thanks to my family for coming to cheer me up and to number 2265 for helping me a lot. See you next time!